Rocky Mountain National Park offers its visitors a wide variety of options when visiting the nation’s highest national park. From beautiful drives, hiking, wildlife viewing, photography and gentle walks, the park has it all. A drive is always a good way to start your RMNP adventure. From the car, you can take a look at nature in a mostly undisturbed setting. Highway 34 offers the driver the opportunity to explore stunning views. Along the roadside, there are several parking spots that offer points of interest and magnificent views. Follow Highway 34 to the crossing of the Continental Divide. Your journey begins at the Montane Ecosystem and follows it to 9000 feet where the Subalpine Ecosystem begins. Here you will drive by running streams and rock formations that only Mother Nature could imagine. Look through the forest for tracks and trails of our Rocky Mountain wildlife. At 9500 feet the Alpine Ecosystem begins. The trees disappear and the flora and fauna are amazing! View open rugged lands that offer very little oxygen and watch for the animals and plants that survive in this extreme environment. For the thrill seeker, Old Fall River Road provides a one-way handmade dirt road up to the Continental Divide. Experience the thrill of driving on the edge. View Chasm Falls and marvel at Mother Nature’s handy work. Admire the back-breaking work that went into making this road. Think of the first trips up this road in a Stanley Steamer as you inch along. Let your mind wander back to a simpler time. Come watch Mother Nature paint the sky in an array of colors. See the sun set on the mountains and usher in the most star-filled sky ever seen! With no light pollution, Rocky Mountain National Park gives the stargazer the chance to see the constellations brightly. Bring a telescope and view the Milky Way from the comfort of your Solitude Cabin patio. Watch falling stars as they end their travels. 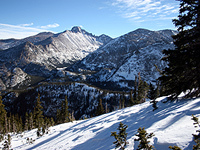 Come visit Estes Park and Rocky Mountain National Park and prepare to be amazed!